This branded Niagara Cutlery Steak Knife Set is made with stainless steel blades and rosewood handles. Upgrade your kitchen cutlery with this new Niagara Cutlery Steak Knife Set. 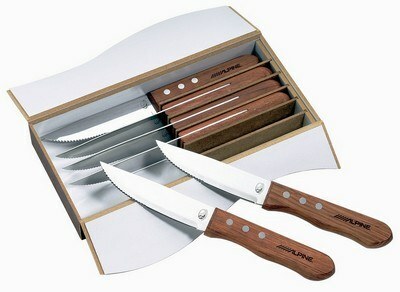 It is a useful knife set to add to your cutlery collection or for use at restaurants and kitchens. It comes in oversized "Steakhouse" design. This elegant steak knife set is made from stainless steel blades with attractive triple riveted rosewood handles. The pricing includes imprinting on all the knives. The utensils are made with FDA compliant material. This steak knife set can be customized with your company's logo and can help to promote your brand in an attractive way.